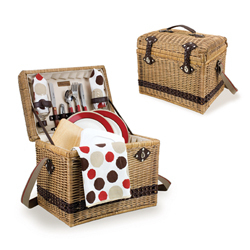 This exquisitely handcrafted picnic basket was designed with romance in mind. The Yellowstone-Moka is made of dark rattan with premium leatherette accents and fully-lined with durable beige PE (polyethylene). Deluxe picnic service for two includes the items listed below. It's ideal for any gift-giving occasion!